Background: Bergenin, a compound derived from gallic acid, is a secondary metabolite of the plant Peltophorum dubium (Spreng.) Taub. Objective: In this study, we aimed to characterize the ability of bergenin to eliminate the radicals in non-biological systems. Methods: We evaluated bergenin’s ability to protect erythrocytes from oxidative damage in a biological system. We have elucidated bergenin structure using nuclear magnetic resonance, X-ray diffraction, Fourier transform infrared spectroscopy, and differential scanning calorimetry. We then evaluated its antioxidant capacity in vitro against DPPH•, ABTS•+, hydroxyl radicals, and nitric oxide, and determined its ability to transfer electrons owing to its reduction potential and ability to chelate iron. We also evaluated its protective capacity against oxidative damage produced by AAPH in erythrocytes, its hemolytic properties, its ability to inhibit hemolysis, and its ability to maintain intracellular reduced glutathione homeostasis. Results: Bergenin concentrations between 0.1 and 3mM significantly (p < 0.05) and dose dependently decreased formation of ABTS•+, DPPH•, nitrite ions, OH•, reduced formation ferricyanide, ferrozine-Fe2+complex, inhibited AAPH-induced oxidative hemolysis of erythrocytes, raised GSH levels in the presence of AAPH, inhibited AAPH-induced lipid peroxidation in erythrocytes. Conclusion: Bergenin may represent a novel alternative antioxidant, with potential applications in various industries, including drugs, cosmetics, and foods. 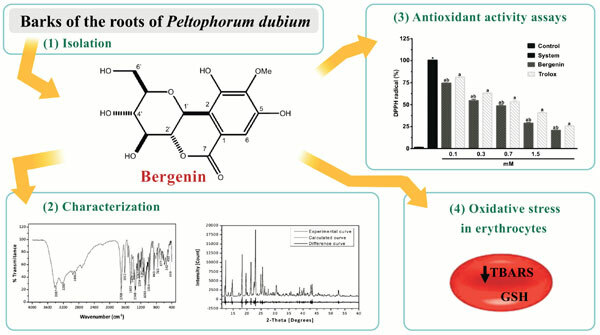 Peltophorum dubium, bergenin, biological activity, antioxidant, erythrocytes, free radicals.